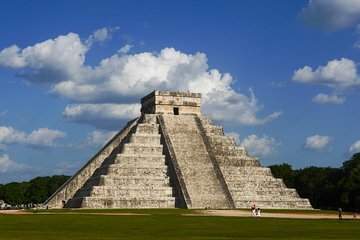 Visit the ancient city of Chichen Itza on a full-day, small-group tour from Cancun, and explore one of the Maya world’s most spectacular places. Travel in a comfortable, climate-controlled van, with breakfast, lunch, and all entrance fees included, getting an early start so you can visit Chichen Itza in the cooler morning hours. Group size is limited to 15 people for more personal service, with the chance to swim in Cenote Ik Kil and see the highlights of Valladolid, a tranquil town with beautifully preserved colonial architecture. Our group of 13 (including one toddler) thoroughly enjoyed our excursion. The best part is that they pick you up early, which means you beat the heat and crowds at Chichen Itza. When we arrived, there was no line and the morning was still comfortable. When we left, the line to get in was long and it was starting to get incredibly warm. I can’t imagine all that walking in the heat of the day! On the way there, we stopped by a delicious little restaurant where we enjoyed homemade tortillas and yummy tacos. I recommend the carne asada! The cenote is breath taking and absolutely a must! You can rent towels and life jackets there and there are also lockers and a large changing room. A buffet lunch was provided at the cenote. The fried fish was delicious. Finally, we stopped by a town but it was too hot by then for us to really enjoy it. Our tour guide and driver were both very friendly and knowledgeable. We learned so much! Thank you for a perfect day! We went on this tour last week. Edmundo Carvallo Joel was our English speaking tour guide, through trip advisor. It was a fantastic history lesson at Chichen Itza. The lunch at the Cenote Ik Kil was excellent and the Cenote was beautiful. We highly recommend this tour.